Highway 29S at Zonnebeke Creek, south of the John Hart Highway, in June. 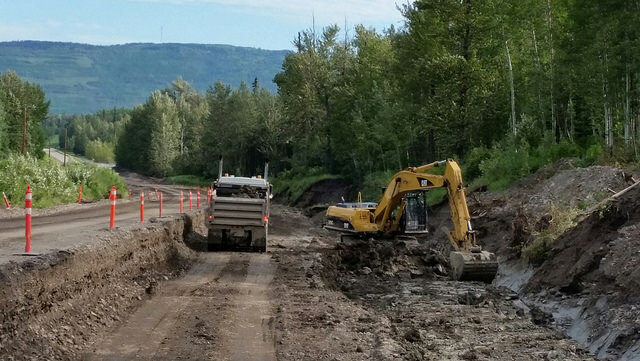 We’re working as hard as we can to repair roads in the South Peace region and get everyone back to their regular route, after major flooding in mid-June 2016. We understand you want to drive your usual route, and not have to take detours. We also know there are a lot of extra-large truck loads that depend on some of those damaged roads, to get to their destination. With approximately 300 locations that were hit by the flood, there’s a lot of work ahead. Here is a little of what goes into repairing roads and bridges, making them safe for you to travel again. Assessment – identifying all the factors in the damage, and what skilled people, supplies, and specialized equipment are needed to fix the problem. Getting the help there – making arrangements and/or entering into contracts to put the right resources into place (Yes, that’s paperwork – but it’s necessary to ensure we work with skilled and reputable companies that meet our standards). Coordinating utilities – locating and working safely around underground and overhead utilities that are close to the repairs, and within the road right of way, can mean involving utility companies. Removal of debris – re-routing water, and moving logs, rubble, mud and other debris elsewhere. Slope stabilization – reducing the possibility of rocks or mud from nearby slopes, from eroding and covering newly repaired road. Surveying – determining and staking out the road’s path while ensuring works are located within ministry property. Bridge and structures – assessing structural integrity, and depending on our findings, repairing the existing structure or installing a temporary structure. Compacting the ground – constructing a strong foundation where the road will be re-built. Putting down new layers of road – adding different gravel types in layers and compacting them before laying down pavement. Paving – applying paving materials in layers to provide a smooth, uniform and strong travelling surface. Line painting – laying down the lines that help keep you on the road and in your lane. Sign installation – choosing and erecting signs for safe navigation, indicating things like speed limits, curves, bridges or other warnings. 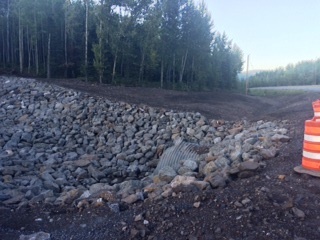 Restoration underway at Tippy Corner on Highway 97, August 5. In early August 2016, we had close to 200 pieces of equipment on the job at repair sites. While a number of affected routes have reopened, there is still a lot of work to be done and our crews are doing their best to repair damaged sections and reinforce them to help prevent future damage. Thank you for your patience and for helping everyone stay safe. Please drive carefully and obey all signage and traffic control people in work areas – our crews and big machines will be around for the next long while. As always, know before you go by checking DriveBC for current planned events and future planned events (construction and road maintenance, plus things like parades or athletic events), incidents, road conditions and weather. That’s amazing that you guys have almost 200 pieces of equipment on the job. I bet that helped out a lot. I can’t even imagine what it’s like fixing all those damaged sites. I wonder how long it takes them to repair all those roads and paths. Depending on the extent of the damage and the time of year it happened it can take time. Thanks for connecting with us here!